Only $4.97 for Friday’s full card. Instant download through PayPal. Saturday’s sheet coming later today. 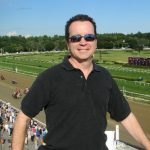 Last year on BC Saturday, Rich gave out TOP selections Trinniberg ($29.40, along with a COLD $203.40 Exacta) and Mizdirection ($15.80), plus two underneath value plays, Tapizar and Fort Larned, at $32.60 and $20.80!